There have been countless times while out for a hike when an achy, heavy feeling hit me in the gut and I thought “Holy crap am I ever hungry!” I must eat on a regular schedule or risk passing out or throwing up. But unfortunately I’m one of those poor saps who is allergic and/or sensitive to a laundry list of foods and therefore cannot eat “willy nilly”. Oh sure I “willy nilly” and tempt fate every now and again but then the dreaded happens. I’m instantly congested, bloated, itchy and don’t even get me started about my bowels. Let’s just say I am a very sensitive girl, inside and out! During one of my recent hikes I thought to myself, “For the love of sweet Jesus, what can I prepare for myself that is 1) something I’m not allergic to and 2) substantial enough to give me the energy required to complete this hike?” Then it hit me. Like literally a chestnut fell and hit me square in the head and the most wonderful, spectacular idea was born. I’m allergic to wheat (and by extension gluten) and sensitive to most grains. But nuts and seeds I’m fine with. I searched my mind for what concoction begs to be made with nuts and seeds. Then one of the most brilliant ideas came to mind. Granola!!!! Oh I have missed that sweet, cinnamon flavour for so long. I get all nostalgic recalling my youth of chowing down on bowls filled with granola while watching Saturday morning cartoons (dab, dab a tear just crest my eye). Of course back in the day I had no idea it was the wheat and oat granola I grew up with that had me hacking like a cat choking on a hairball. Anywhooo, once I returned home from my hike I began experimenting and conjuring up my greatest culinary achievement of all time. A little bit of this, a dabble of that and behold my creation was complete. It was nothing short of pure, edible alchemy! What I am about to share with you will tickle you in forgotten or unknown places. The moon and stars will align and heaven will be that much closer. No more hawking, wheezing, hives or the trots (yeah I went there). Yes Granola – raw, wheat free, gluten-free, grain and dairy free. [bow]… You’re welcome. *Use one or combine several to form a mixture. For nuts use almonds, cashews, walnuts, pecans. For seeds, flax, pumpkin, hemp, chia. If cooking, preheat oven to 350° F.
Place parchment paper on dehydrating trays if making raw granola or a cookie sheet for baked granola. Place nuts equalling 3 cups into food processor and pulse until nuts are broken into oat size pieces. If using almonds, chop separately. Note: I use soaked/dehydrated nuts, seeds and groats to increase their nutritional value and make them easily digestible. 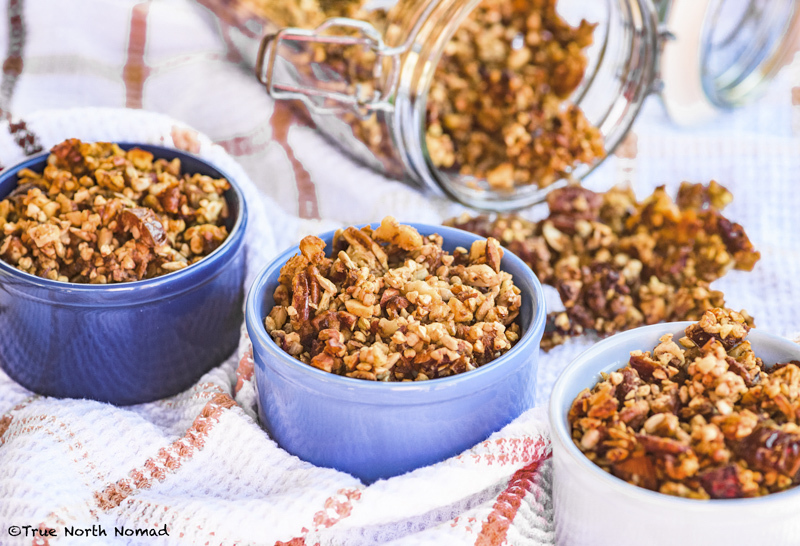 Mix chopped nuts, buckwheat groats, seeds and chopped dates into a bowl and stir to combine. Add water, dates, honey, coconut sugar, spices, salt and vanilla to a blender (a bullet does just fine). 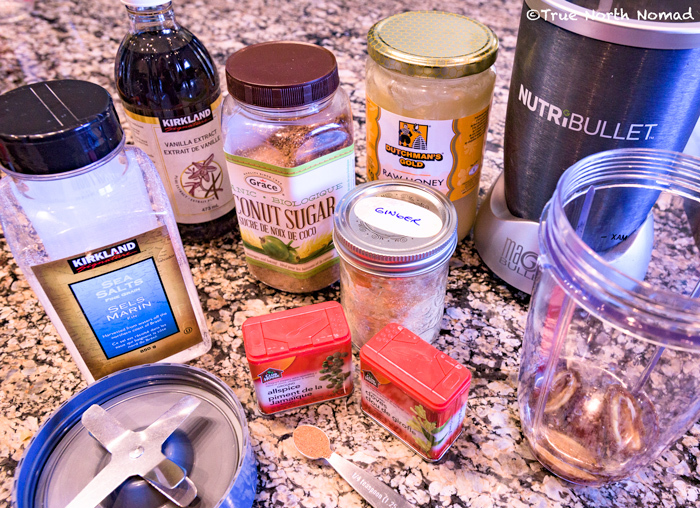 Blend until all mixed and the dates are broken down and only a liquid is left behind. 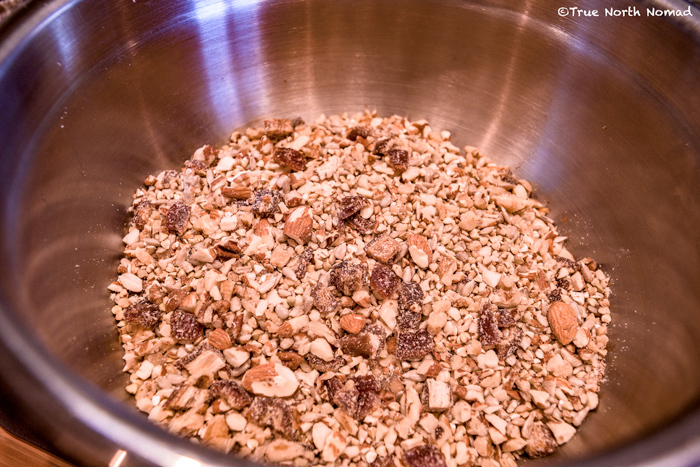 Add liquid mixture to nut mixture and blend until all the granola is coated with the sweet syrup. 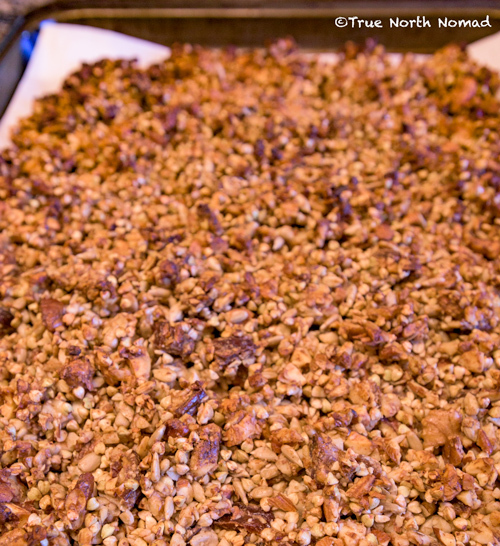 Spread granola out on parchment paper evenly. 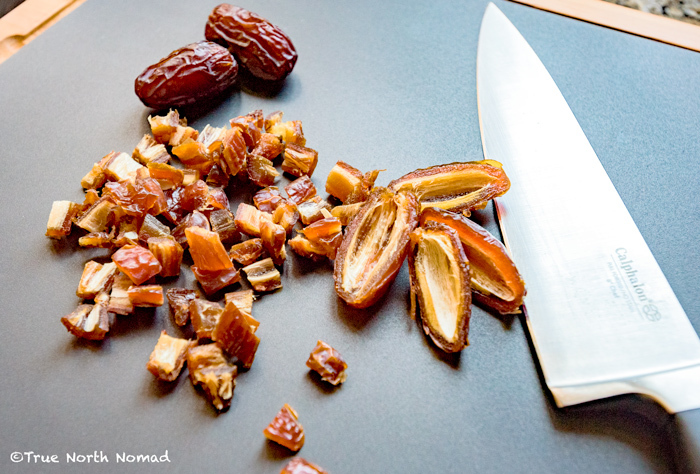 For raw, dehydrate at 115° F for 10 -12 hours. For cooked, bake for 20 minutes or until golden brown. 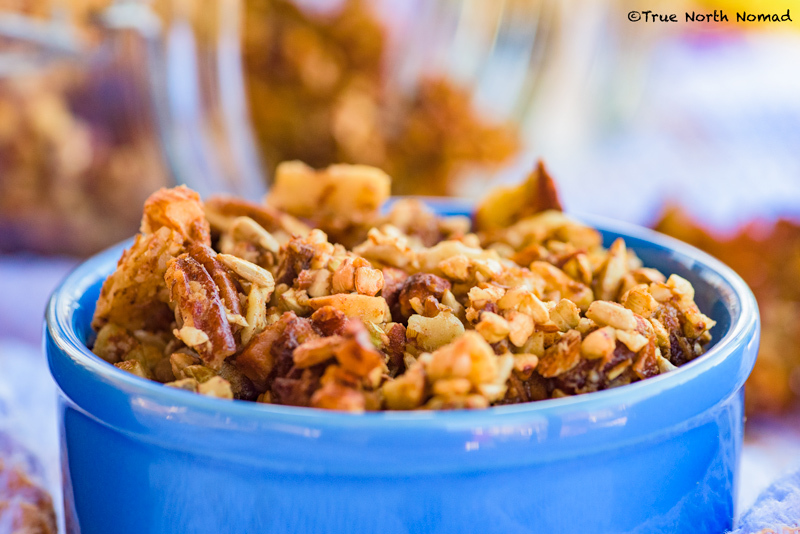 Remove tray/pan when done and break apart granola. Can be stored for up to a week in an airtight container. Package this goodness in a snack size bag and the next time you are out and about exploring your world, voila instant snack with no guilt and a ton of pleasure. Or if you are as sentimental as I, put on a good cartoon sit down on the couch and share this deliciousness with a special someone. Do you have any recipes to share for those of us with a gluten or food allergy? Preheat oven at 400° and place True North Nomad in middle rack and cook for one hour. Remove, let stand and enter your email address top left, bottom right or bottom centre of this post and click “Follow” and never miss an impassioned tale again! What a delicious-looking variation! I made batches of my granola recipe (https://twiceastasty.com/2017/02/28/granola/) last year for an event and decided I needed both a gluten-free and a nut-free version, since at least 1 of the 150 people I was feeding would have a gluten intolerance or nut allergy. For the gluten-free batch, I discovered a local grain source: Montana Gluten Free rolled oats: http://www.montanaglutenfree.com/shop/. It’s a good thing granola is so adaptable. I love rolled oats – didn’t even know there was a gluten free version. Thanks for sharing! It is so easy and honestly very delicious!! I hope you enjoy, thanks for dropping by! Hi a few days ago I also discovered that in sensitive to gluten. Do you have any good tips for food or bread that’s gluten free that you like! Hi! Welcome to the dreaded land of gluten allergies! Gluten is found in everything from canned soup, salad dressings, soy sauce to tooth paste. So I literally make most of what I eat from scratch. Udi’s makes a great french baguette, everything bagels and hamburger buns. Brands like Bob’s Red Mill, Robin Hood and PC (if you are in Canada) have great gluten free flour blends if you want to bake. Imagine creates a great gluten free broth to make your own soups. If you have anything specific you’d like a recipe for let me know and I’ll see if I have one. Also stay posted, I will keep posting gluten free recipes! Good Luck! I’m not a fan of traditional Thanksgiving food (because I’m a monster/all I eat is candy) but this looks like the bomb! 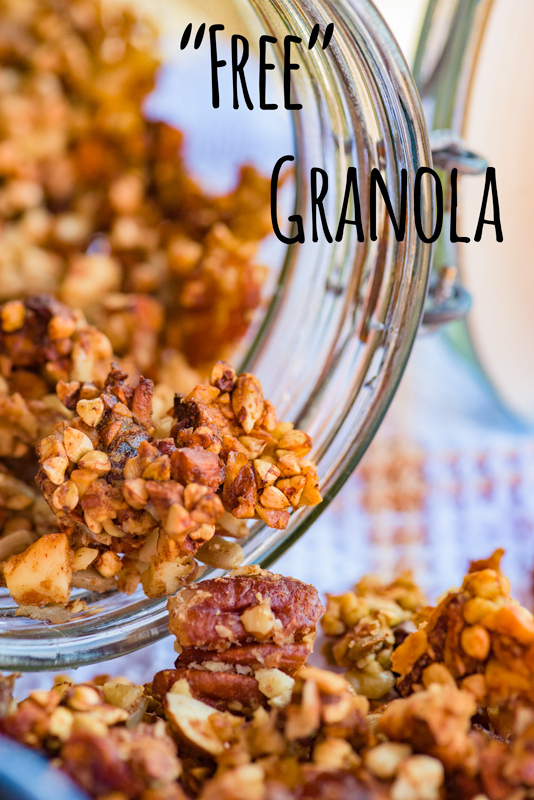 This granola is delicious and filling! Hope you had a great Thanksgiving! Mmmmmm omg looks so good!!!! it is good and easy to make! You could probably use stevia or xylitol in place of the coconut sugar. The honey helps it stick together.